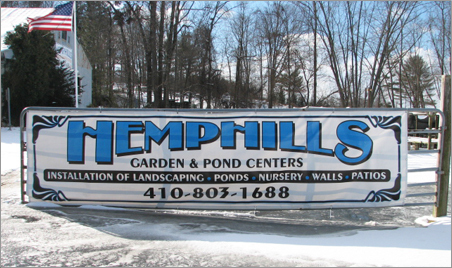 Hemphill's Garden and Aquatic Centers, Inc. was established in 1984. We are a family-owned and operated business run by Jim and Betty Hemphill; Matt Hemphill (Vice President) and Jaime Klema (Secretary). We have a professional staff of employees that are highly qualified in the nursery and pond industry. In addition to our nursery, garden and aquatic centers, we provide professional landscaping and pond installation services throughout Harford County and the surrounding areas. The owners and employees of our company are here to help serve and educate you for all of your pond and landscaping services. We sell the largest industry products on the market today to give you the most up-to-date technology in the pond and garden fields. We have liners and preformed ponds, pumps, filters, fish food, etc., to complete the job in building your own pond or we have experts to come out to your home and give you a free estimate for us to install one for you. We clean, repair and maintain ponds as well. The latest new plants on the market: annuals, perennials, vegetables, herbs, shrubbery, and a variety of trees are a great part of our 12-acre garden center. We are nestled in the heart of Fallston, Maryland at 2222 Fallston Road 21047 surrounded by great restaurants and agriculture settings. Its a beautiful setting just to take a Sunday drive. We are near Ladew Gardens on Route 146. Please note: Our hours may vary due to weather & off season projects. Please call to confirm store hours that day.